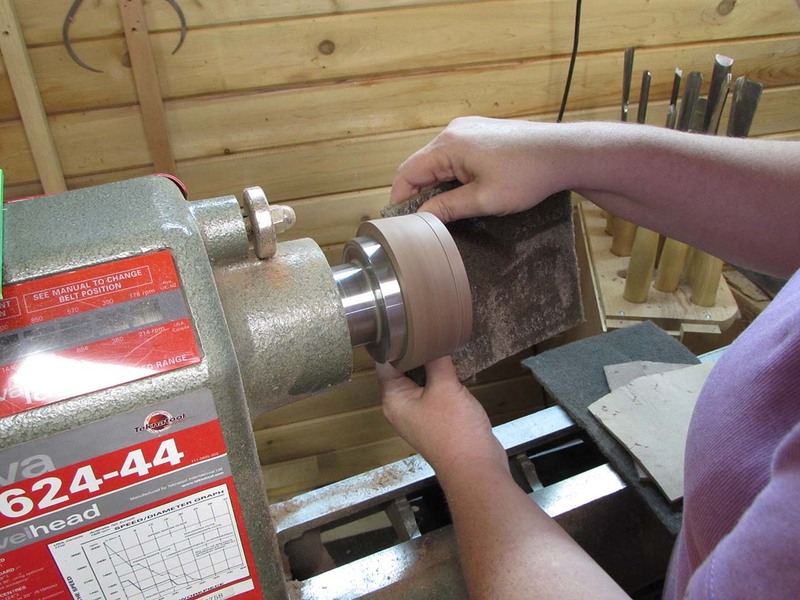 My wife Tracie has been learning to use my lathe recently. 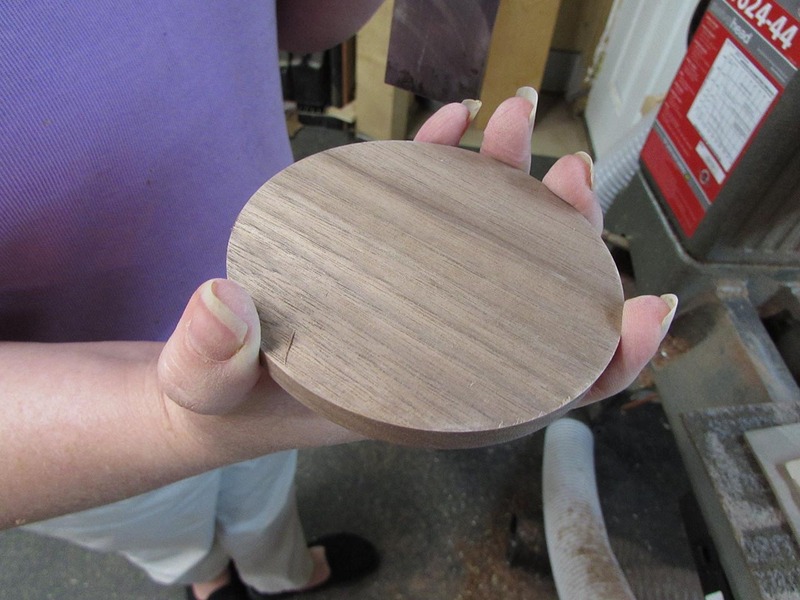 One of the projects that she really wanted to make was a set of drink coasters. 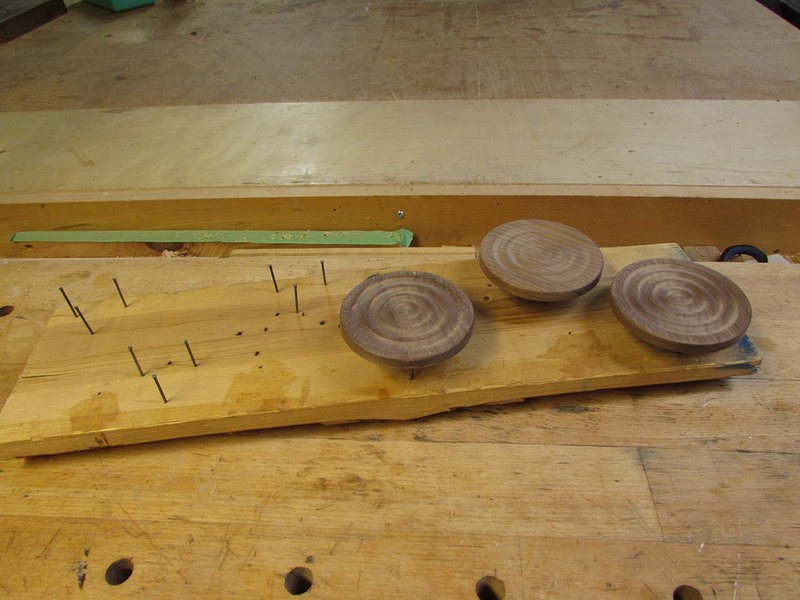 The first two sets that she made were out of a 4″ block of wood, that she turned down to a cylinder, then sliced off each coaster with a parting tool. It worked, but parting each of those took a lot of time the tip of the parting tool really gets heated up with all of the cutting. 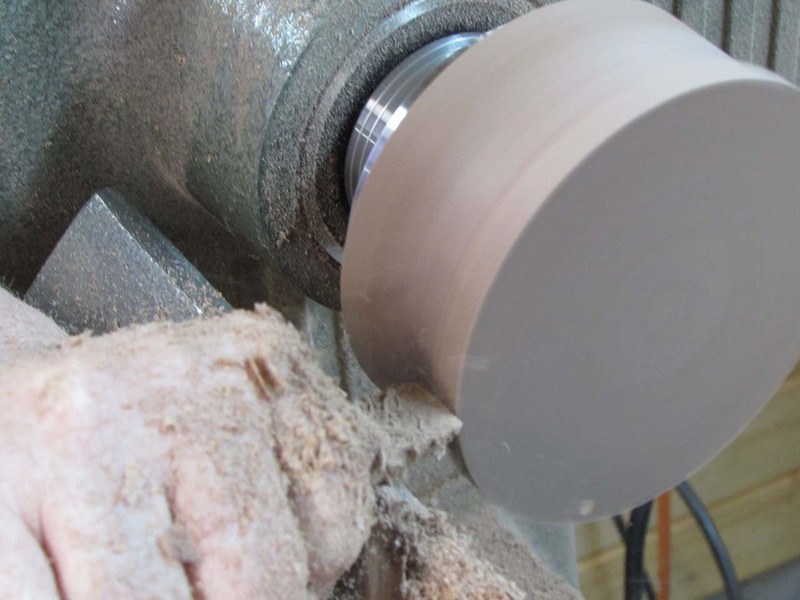 That can rapidly dull a lathe tool. To prevent the need for all that cutting, we are trying a different approach. 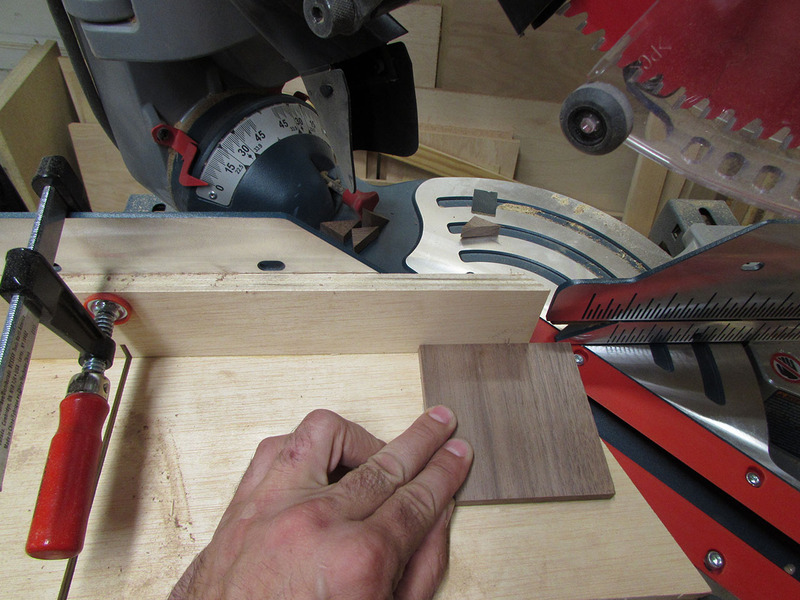 I started with some walnut that was already planed down to 3/8″ thick, then I cut the board into six, 3-1/2″ squares, on the table saw. 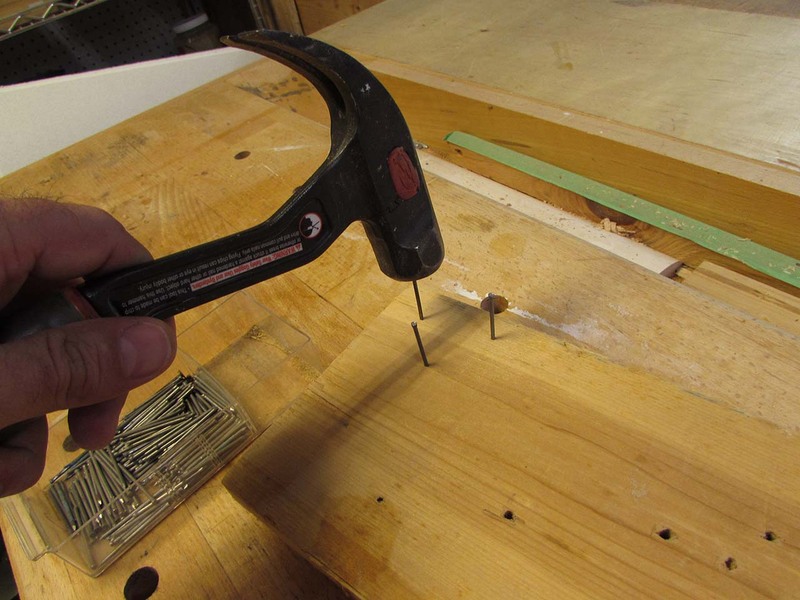 I clamped an auxiliary fence to my miter saw, and sawed off a 45 degree angle on one side. I put a mark on the aux. fence to locate my square, and cut off all four corners. 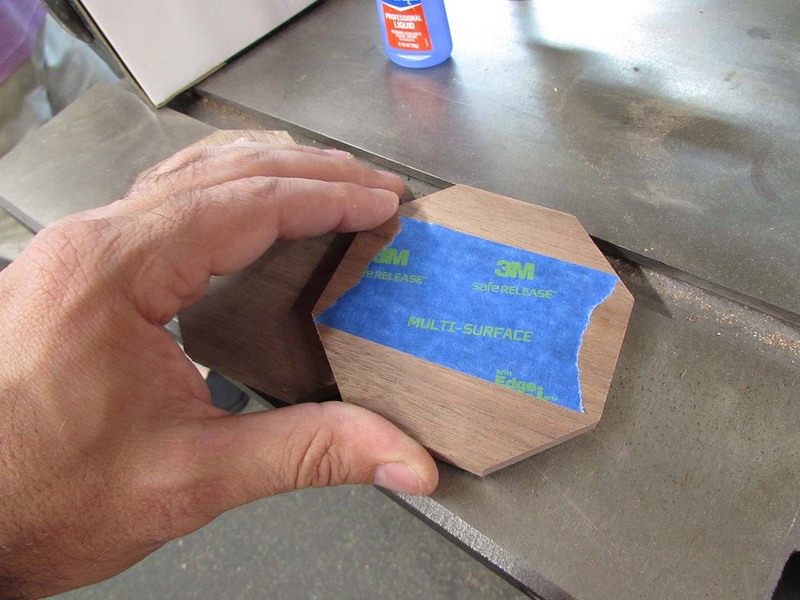 This will make it easier to cut down to a circle. 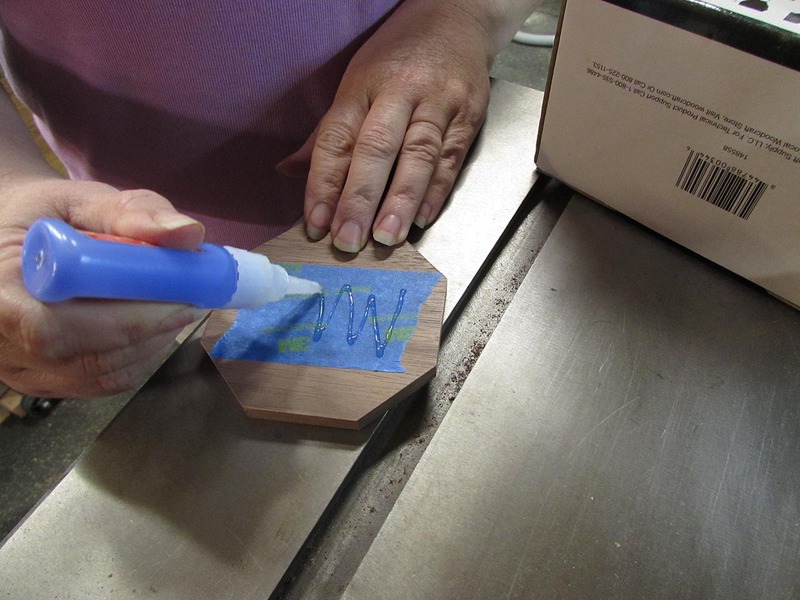 When all of the corners were cut off, we placed a 2″ wide piece of painter’s tape on the back of each coaster. 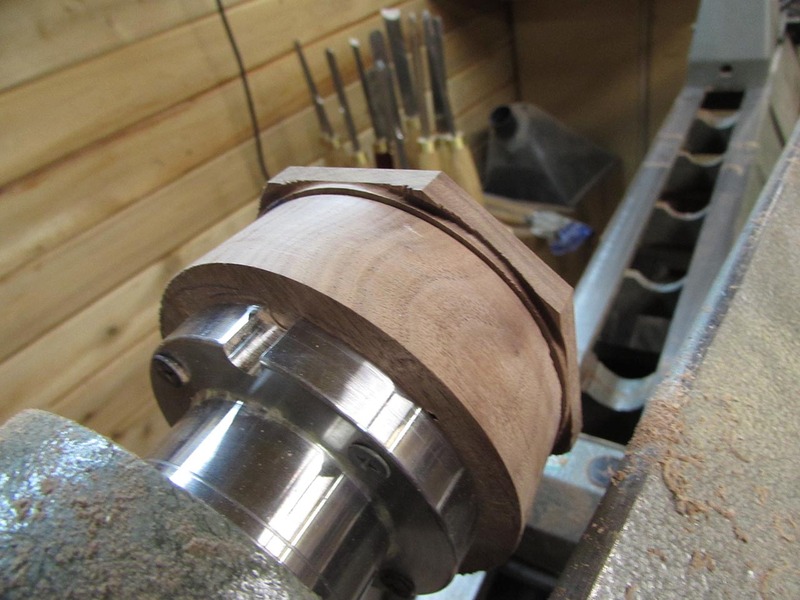 I have a 3-1/2″ diameter piece of wood mounted to a face plate, already set up on the lathe. We put a piece of tape on it as well. Tracie applied a zig-zag of fast-curing Super glue one of the pieces of tape. 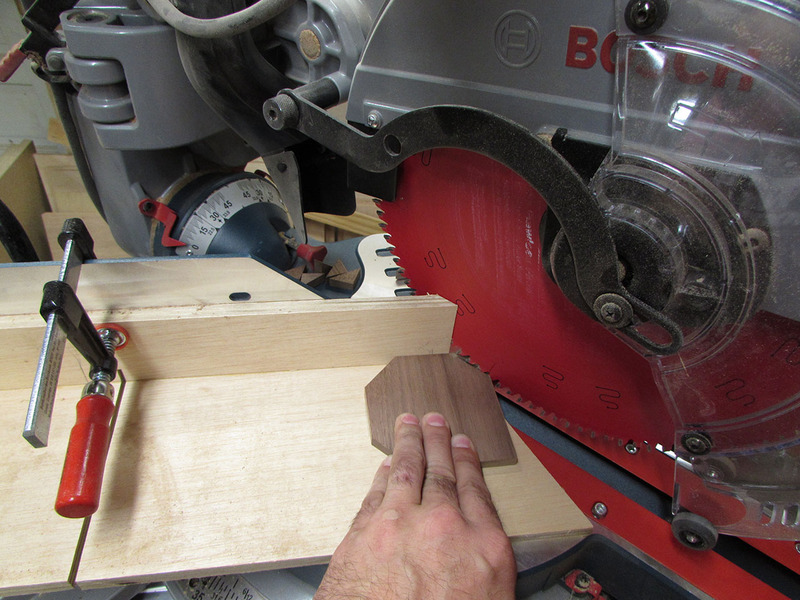 Then centered the blank onto the face plate and pressed it in place for 30 seconds. After that, we were ready to turn. 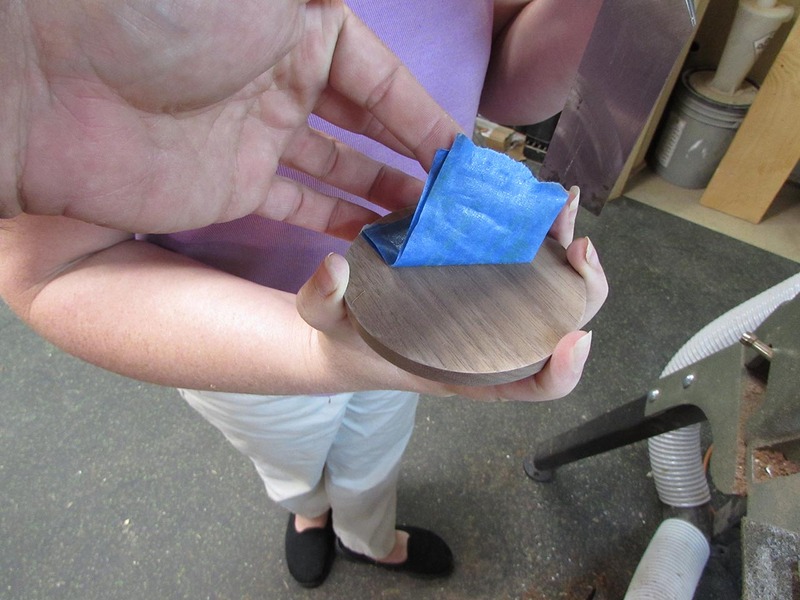 The first coaster we made in this fashion was square to start, and we got some tear-out along the side when one of the corners caught. 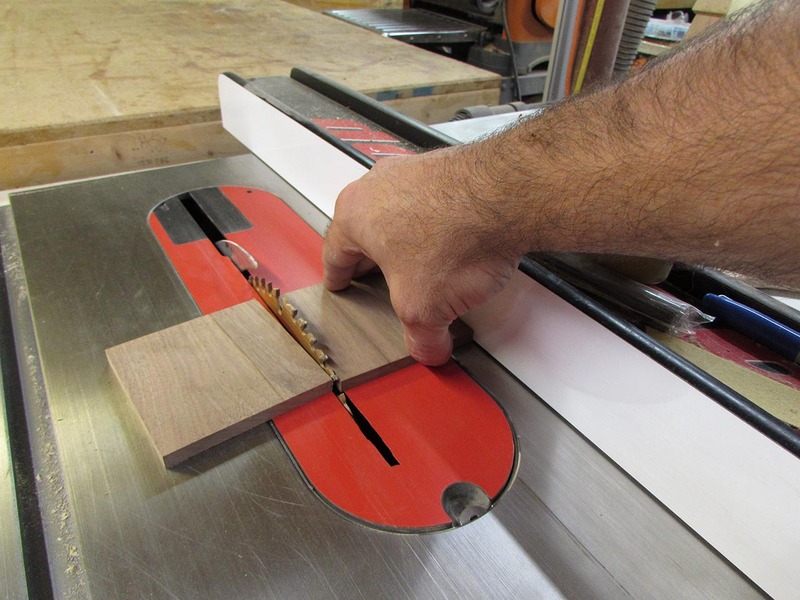 To prevent this, we cut off all of the corners as well as cut in a relief groove, with a detail tool. 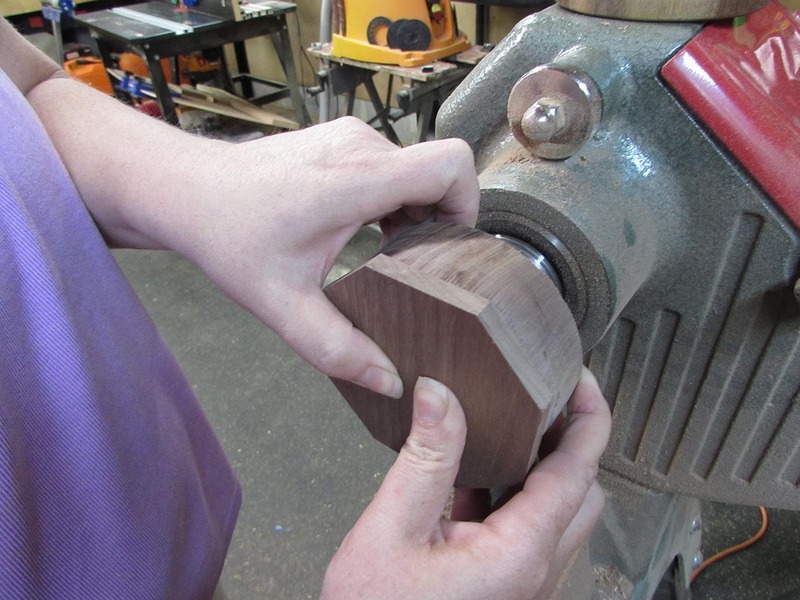 This groove will also serve to set the depth of Tracie’s final cut when cleaning up the sides. 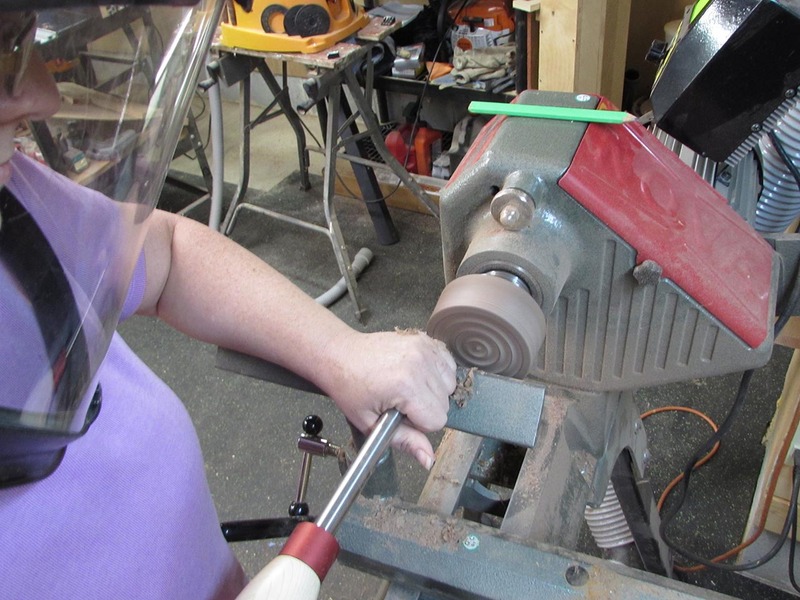 Next we fired up the lathe at about 2,100 rpm’s and Tracie cut the sides down to her mark. I don’t know if I mentioned this in a previous post, but I found a cool upgrade for my Nova 1624 lathe. 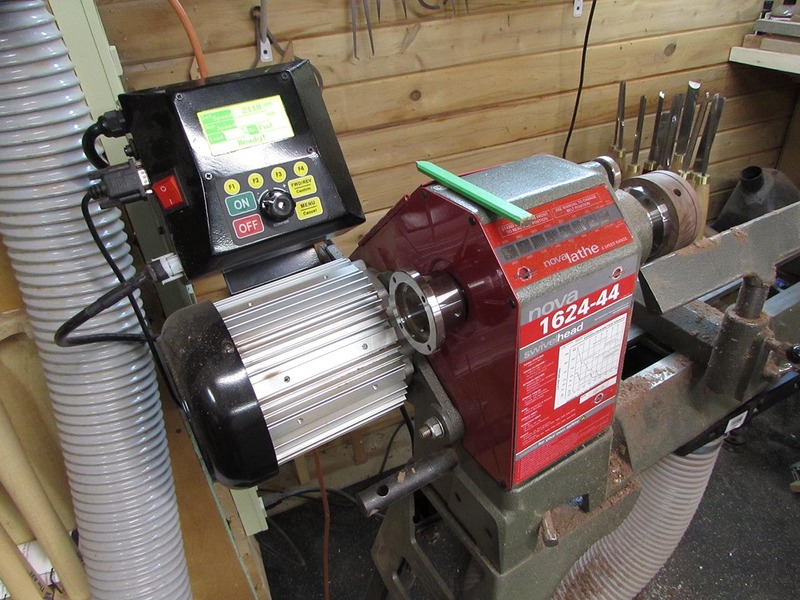 You can buy an upgraded motor for it that converts the lathe to a variable speed drive. 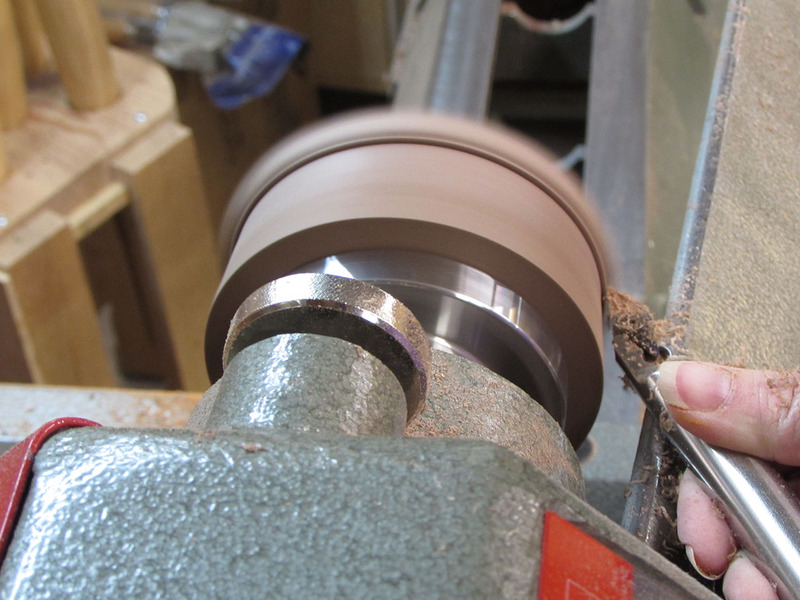 That means I no longer have to turn the lathe off and move a belt to adjust the speed. Now I can go from 100 rpm’s to 3000 rpm’s while it is still running. 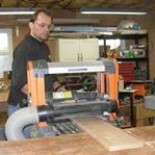 A good variable speed lathe usually runs $2500 and up. You can buy the Nova 1624, on sale, for around $800 and upgrade it with this kit for about $650, saving a considerable amount of money. Anyway, getting back to the coasters… One thing we don’t like about the glass coasters, that we were using, is that they are so smooth and flat. When your glass gets wet from a spill or condensation, the glass sticks to the coaster. You pick up the glass and the coaster comes with it, for a while, then it falls off and hits the floor. 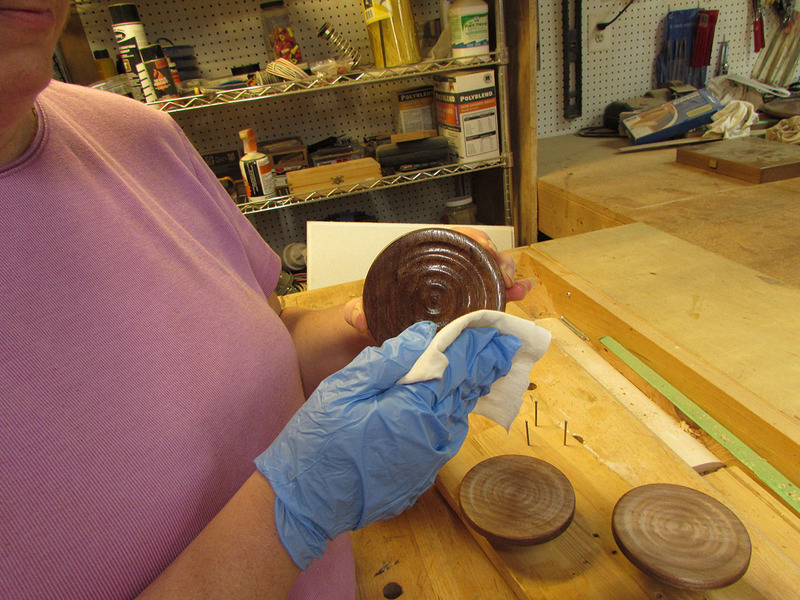 To avoid this with her coasters, Tracie cuts a series of concentric rings along the bottom. This leaves an air break so no suction can form at the bottom of the glass. 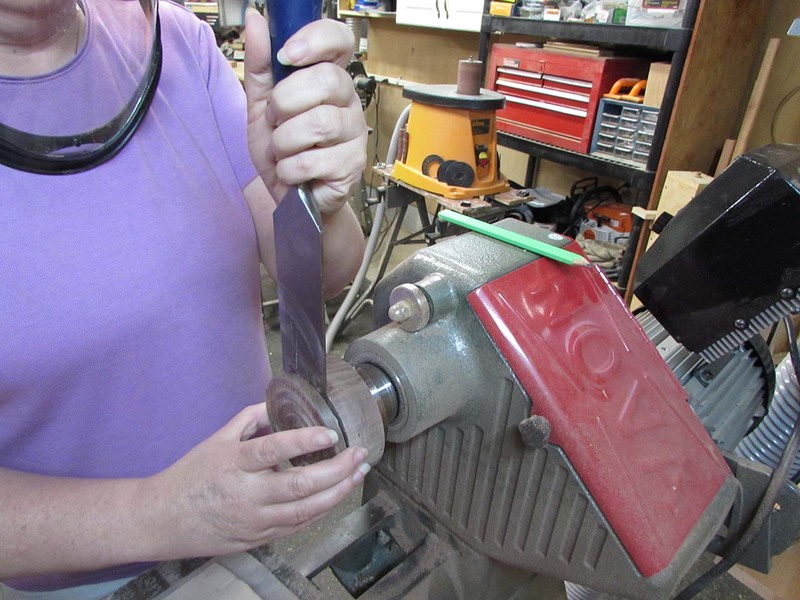 She marks the rings on the face and makes a shallow series of cuts with a round scraper, about 1/16″ deep. 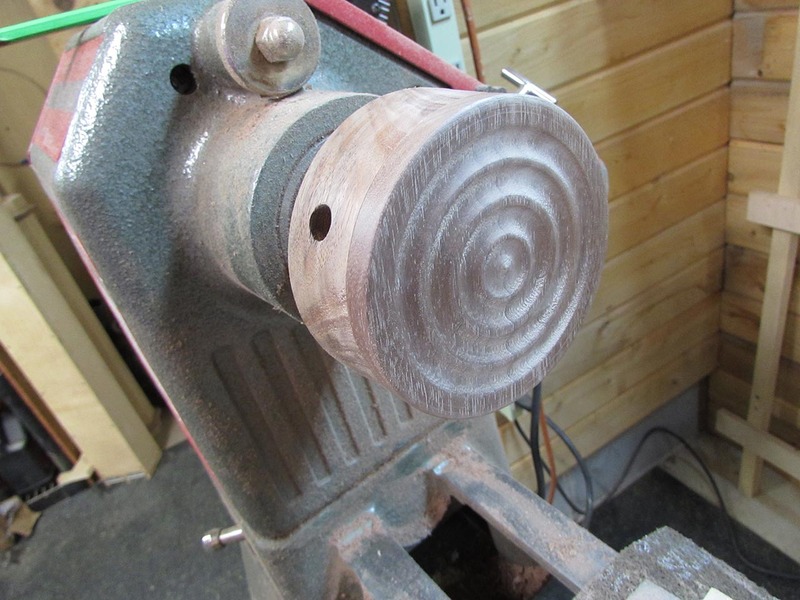 The final step, on the lathe is sanding. 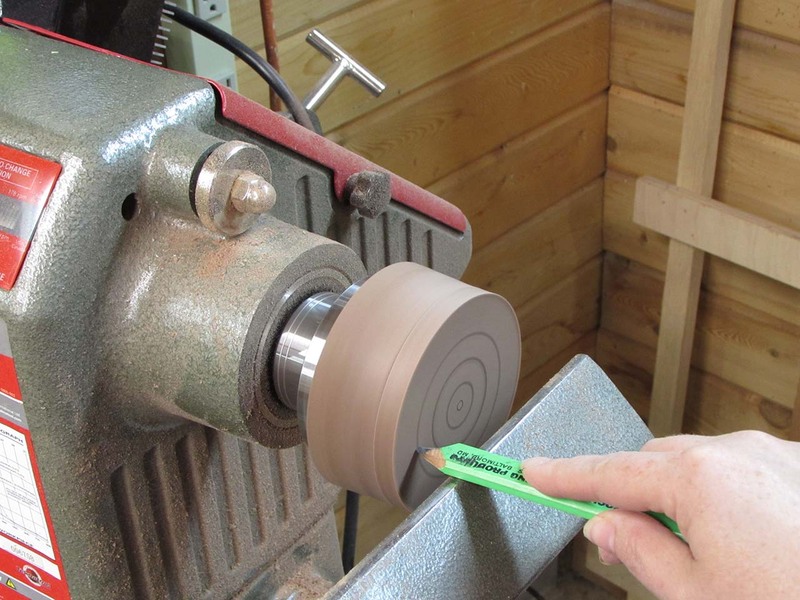 We won’t be doing the finishing on the lathe because we want a more durable finish that the friction finish we normally use on pens. The beauty of using the painter’s tape and super glue is in the removal of the part. We just slip a chisel between the two parts and it just peels off. 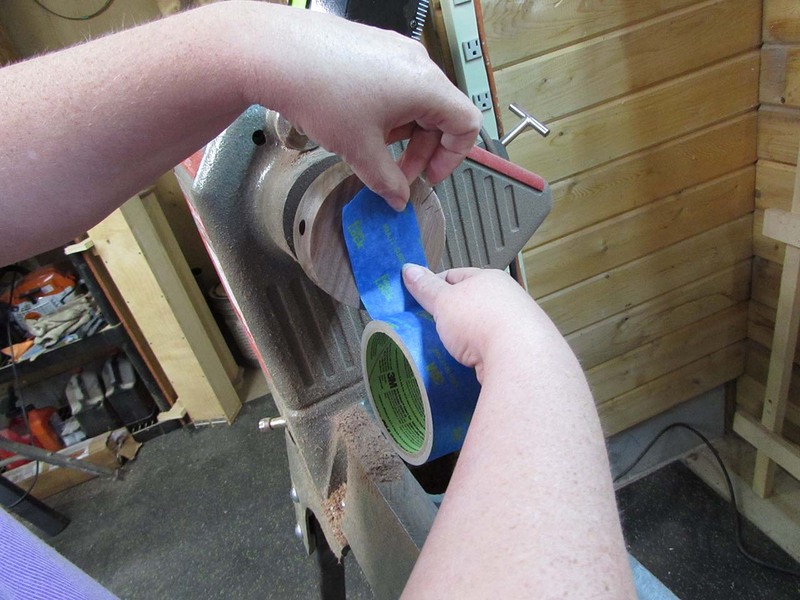 After removing the tape, you have a smooth back with no parting tool marks to clean up. 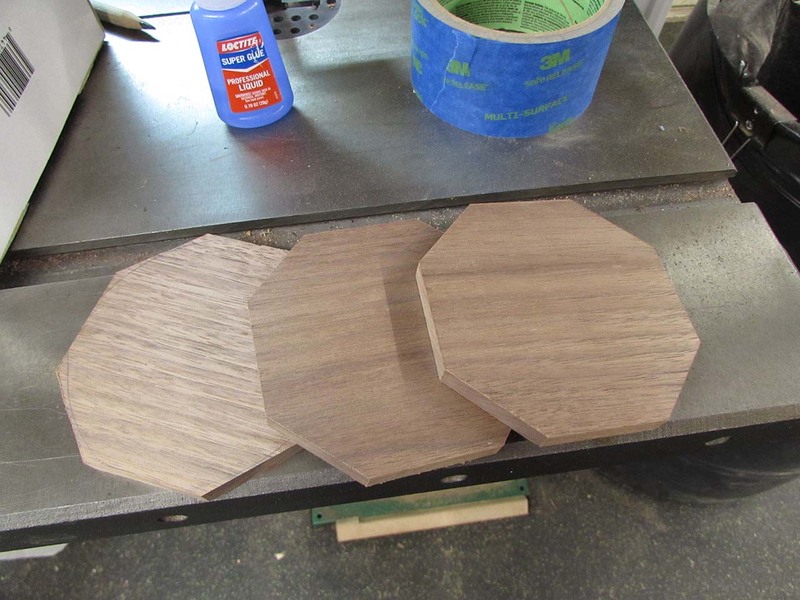 In the past we used painter’s pyramids to finish these, but they are a little big and awkward for coasters. I decided to try a few finish nails instead. 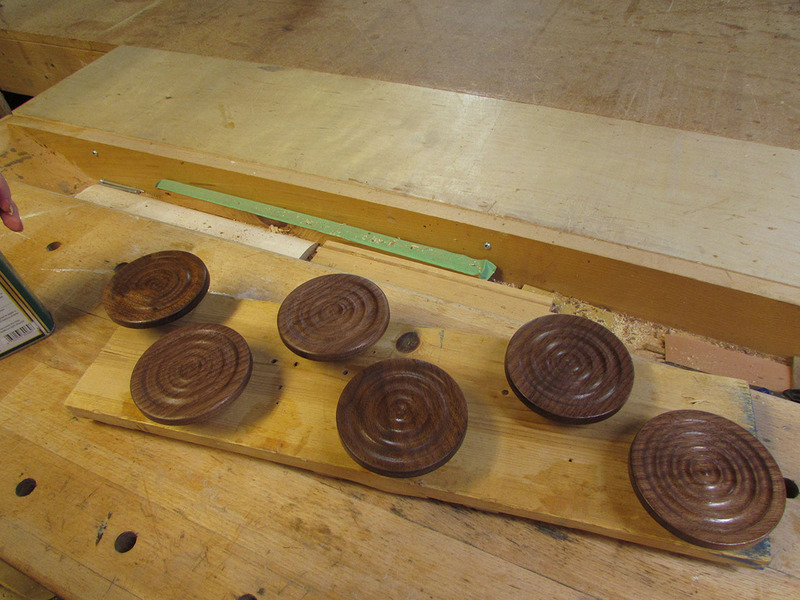 I staggered 6 sets of finish nails so I could finish all of the coasters on the same board, and I have the added benefit of being able to move the whole assembly if I need to use the bench. 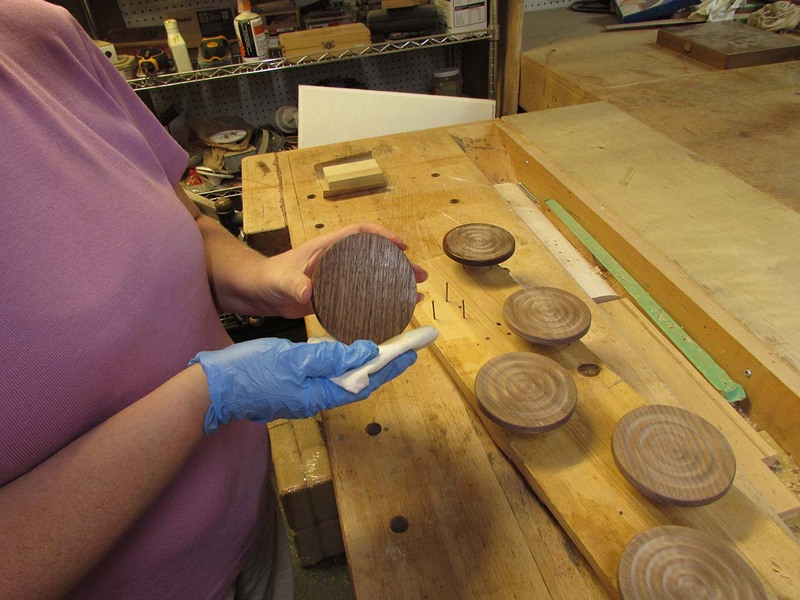 Before finishing, Tracie cleans up the sharp back edge of the coasters with a sanding block. 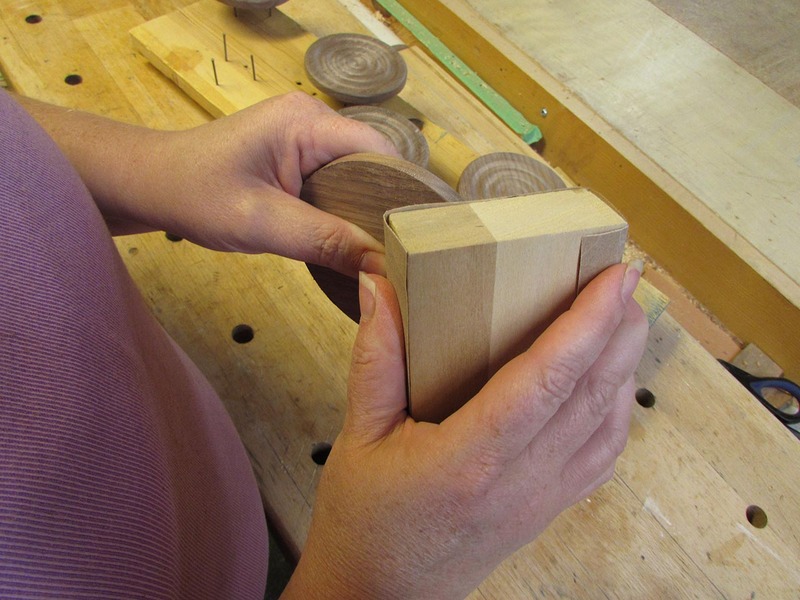 Then she applies the first coat of Tung oil, starting with the back side first, then flipping it over to do the front. 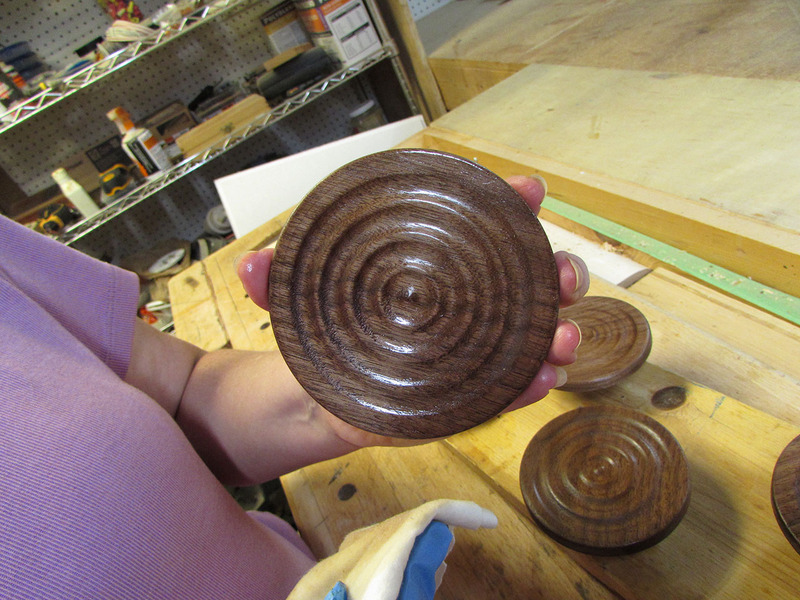 The grain on these is cut at an angle so her shallow cuts create a wavy pattern in the grain that looks really cool. The first coat of oil is now applied. 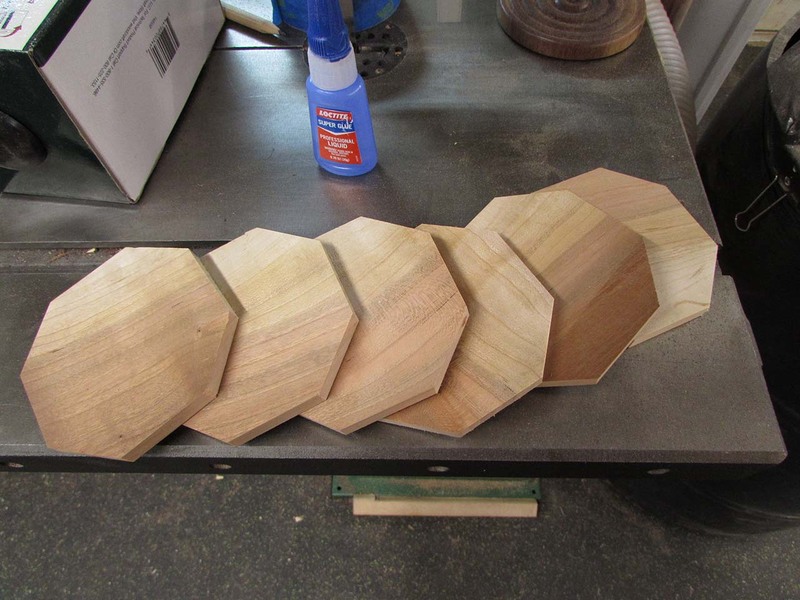 When it dries, she will sand the surface with 400 grit paper and repeat the application of Tung oil, four to six times until the finish is built up. Pylinski Arms LLC. Quality Gunsmithing Since 1984 967 Anderson Hwy. Cumberland, Va. 23040 (804)357-2393 http://www.pylinskiarms.com In God We Trust! 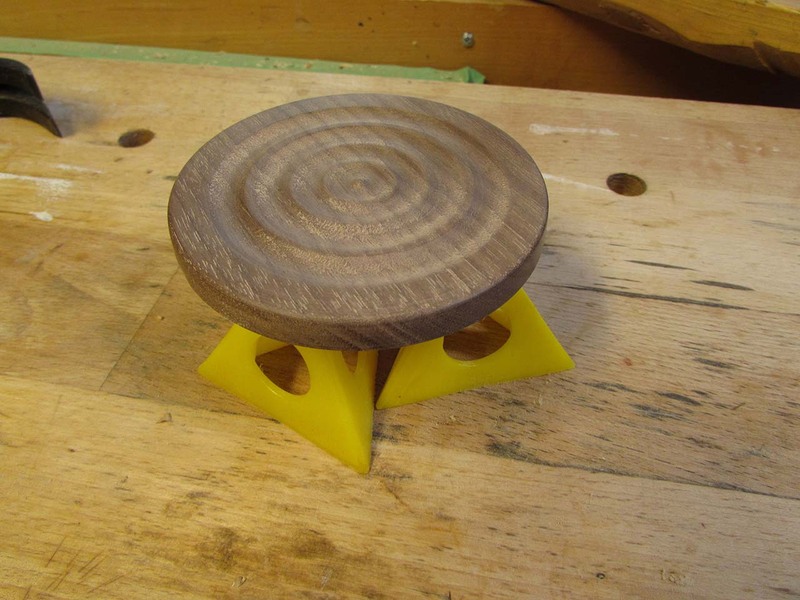 This entry was posted on August 3, 2017 by Lwroten in From the scrap bin..., Tool and tagged make wood coasters, making coasters on a lathe, nova lathe upgrade, Tracie's coasters, walnut coasters.